suppliers have prepared for their customers. UK-based supplier of concrete cutting and drilling solutions Dymatec features the Turbo range of core bits. The Turbo coredrills are designed to provide high-performance cutting in the toughest of materials the likes of reinforced concrete with flint aggregate. Commenting on this new range, Vaughn Newton, Business Development Manager at Dymatec, said: “Hundreds of our customers now rely on the Turbo Coredrill range for superior performance to ensure each contract is completed within schedule and on budget. “The Turbo B® Core is the most popular in the range for medium aggregate and limestone, designed for fast cutting and longer life and is currently getting best results in the USA Mid West, and UK Midlands. “The Turbo S® Core thrives on drilling through steel and very hard aggregates, and is the first choice for drilling in London, Paris and some of the south eastern states of the US." Another UK manufacturer Norton Clipper has extended its diamond tool range with the addition of the EXTREME CG Comfort cup grinder. Specifically developed to lower vibration levels and minimise the risk of HAVS, the new cup grinder is compliant with the latest health and safety standards. This is achieved thanks to a rubber sealing which absorbs the vibrations before they reach the operator’s hands, reducing vibration levels by up to four times compared to conventional grinding methods. The redesigned segment offers auto-sharpening for optimal performance and longer life. Its large ventilation holes ensure better cooling. The cup has been developed with i-HD™ (infiltrated high density) technology. It provides a uniform density across each segment without having to apply high pressure. A special bond impregnates the core structure and binds the diamond grit into the segment, forming an integral part and delivering a higher resistance and homogeneity. Cups engineered with the i-HD technology achieve high material removal rates and long life, with increased safety. With a diameter of 125mm and a height of 24mm, the EXTREME CG Comfort cup grinder is ideal for surface preparation along floor edges and small surfaces. Korea-based heavyweight Shinhan Diamond Industrial has introduced a new state-of-the-art range of diamond blades called “Anycut”. Manufactured by a vacuum brazing technology, the Anycut tools fall into four categories according to application: cut-off blades, chop saw blades, grinding tools and tools for cutting and grinding. The new range boasts a number of advantages over conventional abrasive discs, including low spark, debris and wear, high cutting speed and a long service life. The application of a so-called “booster” device further improves the cutting process. 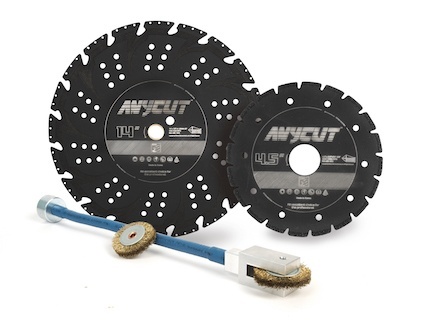 The Anycut blades are capable of sawing an extremely wide range of materials from different metals to fiberglass and wood. Also new from Shinhan this year is a range of low-noise ‘silent’ blades. Produced by Shinhan’s proven Arix technology for high-performance cutting, the blades feature patented steel body and a mixed slot to prevent cracking of U gullets. According to the manufacturer, the new blades generate less noise than any other existing brand of silent blades while coming at a very affordable price. 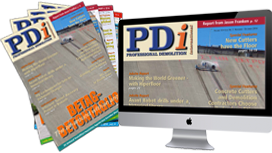 France-based grinding and polishing specialist Au Tour Du Béton (ATDB) has announced the release of three brand-new PCD wheels measuring 250mm in diameter. The new tools fit most single-head grinders currently in the market, including ATDB’s own SH320-SH270-TH500 machines. The wheels have been designed following numerous customer requests for aggressive PCD tools having different shapes. The first model comes with ½ cylinders PCDs for treatment of concrete surfaces. The second type features square PCDs that allow getting rid of thick resin floors in no time. But the most high-performing model is the wheel equipped with ¼ cylinders. All three models are manufactured in France using high quality PCD bits and CNC machined plates. Located on the coastline where Lake Mälaren meets the Baltic Sea, Sweden’s capital is often referred to as “Venice of the North”. And, just like the Italian city, many of the 17th century buildings in the Old Town of Stockholm are suffering from poor foundation conditions, slowly sinking into deep clay. A big rescue project is currently underway to replace the decaying wooden poles supporting granite ground walls with steel structures. The challenging task of stitch-drilling the large fixing notches for these structures in granite without causing any damage to the old buildings was undertaken by specialist contractor Krügerin AB. Led by manager Janne Hölttä, they found themselves working against the clock in dark narrow 17th century basements, kneeling under low, vaulted ceilings with groundwater leaking through the walls. Luckily, an optimized version of Husqvarna’s D 1410 drill bits helps to speed up the work. “Each operator normally drills 6 to 8 holes a day, but with these Husqvarna bits we can almost double that”, testifies team leader Aliaksandr Nikanau. Anchoring the drill stands without damaging the vaulted brick ceilings was another challenge, solved by a specially developed drill stand that was designed by Husqvarna’s application engineer Andreas Gustafsson.